Men don’t have many options when it comes to swimwear. From relaxing at the pool or the beach to catching waves, men’s swimwear tends to stay the same. 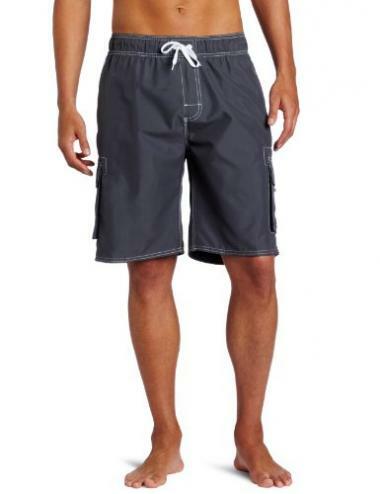 Most men will use board shorts as their swimwear of choice. 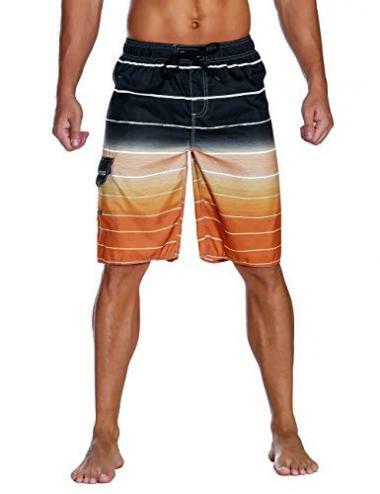 Board shorts come in a variety of styles and have many different color and pattern options available. They are comfortable and can be easily used from the water to out on the town. However, quality board shorts can be hard to find. There are a lot of cheap designs that won’t last. Our guide is designed to help you find the best board shorts that you’ll be comfortable using day after day. Below we have some important features, as well as a list of the ten best board shorts. If you are looking for an affordable but stylish pair of board shorts, look no further. 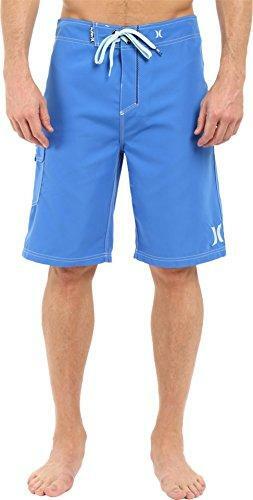 These board shorts offer an attractive style and fit. They have a variety of colors available and are quick drying. The lightweight material is a blend of Polyester and Spandex, which ensures they are comfortable. They have a Velcro pocket and adjustable straps. These shorts are suitable for any beach or water activity. 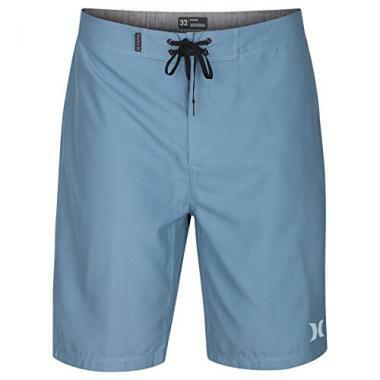 For a pair of durable surf shorts, Kanu Surf’s design offers comfort and style. These shorts are made of 100% Polyester and have an elastic closure. For protection against the sun they have a UPF 50+ rating. The quick dry microfiber makes them lightweight and comfortable. For durability, they have triple needle side seams and strong cargo pockets for storage. These shorts also have a 4-way stretch to ensure you have flex with every move. Unitop’s board shorts design is quick drying, breathable, and lightweight. These shorts are made of 100% Polyester and have a drawstring closure. Unlike other board shorts, there is a mesh lining to comfort. They have Velcro cargo pockets and an elastic waistband. There are a variety of colorful prints available and Unitop ensures their design is function for daily use, holidays, and beach activities. Nonwe makes the list again because of their functional, but affordable board short designs. This pair of board shorts by Nonwe is made of 100% Polyester, which makes them quick drying, breathable, and lightweight. The shorts have a mesh lining, elastic waistband, and adjustable straps. Two side Velcro pockets can hold all your small gear. This design is great for a day at the beach. Hurley is a well-known brand that makes a variety of products for water sport enthusiasts. 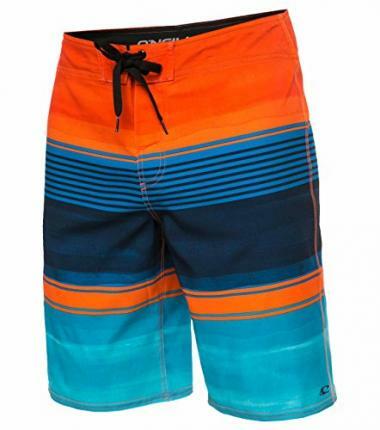 Hurley’s board shorts for surfing are made of 100% Polyester and have a drawstring closure. They are safe to machine wash. The Polyester makes these a recycled super suede fabric design, which is ideal for surfers. The shorts have a 21-inch inseam for enhanced coverage and have a secure fit. There is a back pocket with a flap for secure storage. They offer a classic look at that easily be used on the water or in town. Another famous board short brand for surfers is O’Neill. The Men’s Catalina Avalon Board Short design is an ultra-suede fabric that offers the perfect 4-way stretch for surfers with a 21-inch outseam. The material is lightweight and has a crosshatch fabrication for strength. The shorts have a drawstring closure and a cargo side pocket. The comfort fly can be adjusted by the drawstring. The shorts are embroidered with O’Neill’s classic logo. The shorts can be machine washed to make maintenance a breeze. These Boardshorts are grade A. They have an elastic waist, which offers a comfortable fit. There are two large pockets on the sides and one small back pocket for storage. A drawstring waist makes them adjustable to fit any body form. They are also net lined for added privacy. Hurley makes the list again because of their popularity, style, and durability. The original One and Only Boardshort is a classic design that is perfect for any water sport activity. These shorts are made of 100% Polyester and recycled super suede fabric. The shorts are soft and comfortable with an EZ fly closure and secure fit. A back-patch pocket offers secure storage and has a flap closure. A 21-inch inseam provides all the coverage you need to feel secure. They can also be machine mashed for convenience. 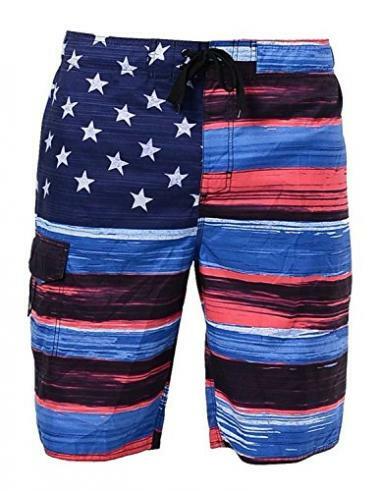 If you don’t mind showing your patriotism in your clothes, then these cool board shorts are the style for you. US Apparel’s design is made of 100% microfiber and have a drawstring closure. They have a cargo pocket for stashing your gear. For easy maintenance, they can be machine washed. To finish our list, Hurley takes the spot again. These Hurley shorts are a blend of Polyester and Spandex to offer a balanced flex. They can be machine or hand washed. For your safety and style, they have reflective details and logos. The EZ fly closure reduces bulk and makes them sleek. The 21-inch seam will have you fully covered, so you don’t have to worry about privacy. 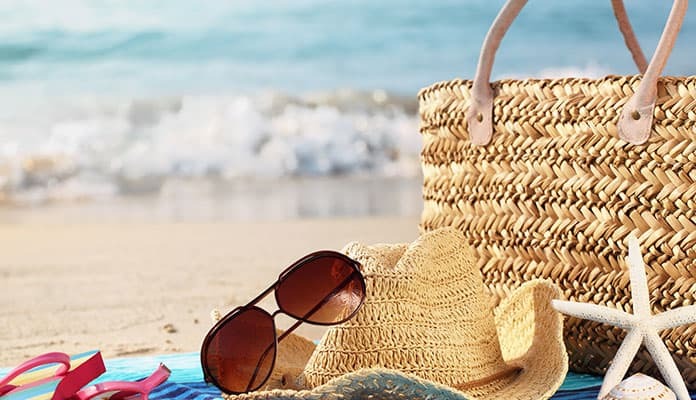 Out of all the swim trunks available for men, board shorts tend to stand out as the most popular choice because they have evolved to be durable, functional, and stylish. Yet with all the options available, you are faced with an overwhelming choice. Here are some features that will help you determine what makes a pair of quality board shorts. These tips will help make the buying process effortless, so that you can get back out on the water faster. There are lots of different materials used to make board shorts, so it will depend on the specific brand or design. The most common materials used are cotton, suede, polyester, and nylon. The material used will affect the price, weight, functionality, and drying time of your board shorts. 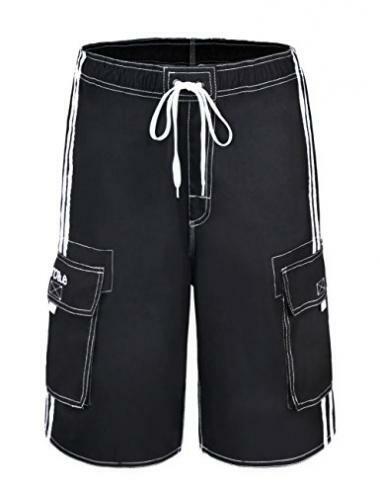 Typical stretch board shorts are made of polyester or nylon. These fabrics are lightweight, affordable, and fast drying. However, professional surfers may choose surf shorts made out of suede. On the other hand, cotton is a breathable and comfortable fabric. Cotton would do best for casual walks on the beach. Stretch board shorts are the best option because they allow for less restricted movement. Most board short brands offer either a 2-way or 4-way stretch. Surf shorts will likely be 4-way stretch because they have no restrictions on the user’s mobility. 2-way board shorts will have a little less room for movement but are still great for beginners. Top rated men’s board shorts are very versatile pieces of swimwear. You can use board shorts for a relaxing day at the pool, a walk on the beach, or for more vigorous activities like surfing and wake boarding. While board shorts can be used for any water activity, it is still important that you consider how you will use your pair. Some men want board shorts only for the style, but others need durable swimwear for intense water sport activities. The good news is that with all the cool board shorts on the market, you shouldn’t have to struggle to find a functional pair. Comfort is important for board shorts. It would be frustrating to buy a pair, only to have them rub or cut in too deep. Comfort can also be found in the material. A soft material will be the most comfortable to ensure there is no skin irritation. The best men’s board shorts will have a durable but comfortable design. The board shorts should be made with soft materials and have a 2-way or 4-way stretch to reduce any restrictions in movement. Comfortable board shorts will also have a proper fit. A good fit will ensure that your cool board shorts aren’t too tight or to big. Your board shorts should rest comfortably around your waist without falling off. Many surf shorts also have a drawstring adjustment. This can ensure that you have the perfect fit for your board shorts and that they won’t fall off during any activities. Other board shorts that are meant for more casual settings may have just a zipper and button closure but can still be used for a quick dip in the pool or ocean. If you are shopping online, you should check board short reviews to help you determine the fit of the specific style of shorts. Other users may comment on how close the sizing of the short is to real life and may give suggestions on how to find the proper fit. There are lots of different styles of cool men’s board shorts. You can find bright colors and fun patterns in a variety of designs. There are also hybrid board shorts that offer versatile fashion. Hybrid board shorts can be used in any setting. They can be surfing board shorts or even just to run errands around town. Hybrid board shorts are popular because you can easily go from the pool to the bar without having to change. Q: What are board shorts? 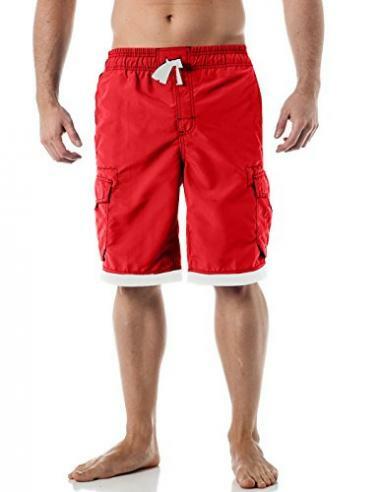 A: Board shorts are a type of men’s swimwear that can be used for a variety of activities. They are versatile enough to be used for extreme adventures or a day walking around town. They are the most common type of men’s swimwear that you will see because they are comfortable and functional. Q: What are the differences between board shorts and regular shorts? A: The biggest difference between board shorts and regular shorts is in the waist. Most regular swim shorts will have an elastic waist, but board shorts do not. Especially with board shorts for surfing, the design will have a more rigid structure that opens with a Velcro fly. A drawstring will secure the waist and make the size adjustable to a degree. The other biggest difference is that board shorts do not have a lining. Most regular shorts will have a lining, but for comfort with different activities, forgo this feature. They are also designed to be comfortable for use without underwear to reduce any chaffing or skin irritation. Q: How to clean and maintain my board shorts? A: You can extend the life of your board shorts by cleaning and maintaining them. Some tips to ensure your board shorts are long-lasting are to not put pointy objects in the pockets, rinse your shorts after each use with fresh water, hand wash your board shorts, and allow them to fully dry before they are stored. By following those tips, you can help ensure that your board shorts are always ready for the next adventure. If you need specific cleaning instructions, check the label or brand information for your shorts. There should be care instructions provided with your purchase. Top rated men’s board shorts will always be a popular choice in men’s swimwear. 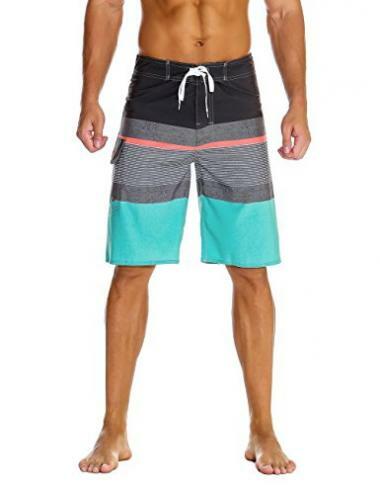 Board shorts offer great style, versatility, durability, and function. With the best men’s board shorts, you will be able to jump from the pool to the ocean. The best board shorts are also a great gift for surfers and boaters. Do you own a pair of the board shorts that made it onto our list? Let us know how they have worked for your water sport activities in the comments section below.